Stephen Overholser, Wayne's middle son, followed in his father's footsteps to become an accomplished western novelist. His first novel, A Hanging in Sweetwater, won the Spur award for western novel of the year. This was an incredible accomplishment for his first novel. Steve went on to produce many other outstanding western stories. Many of Steve's books can be viewed here. 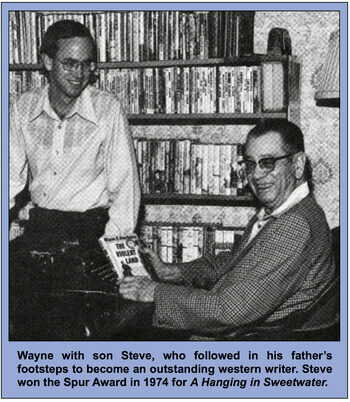 Steve accompanied Wayne on many trips throughout Colorado and Wyoming, learning about the landscape, conducting research at libraries and news companies, and interviewing old timers about the ways of the old west. Steve married Linda Baity Overholser on June 18, 1976. She attended the University of Colorado in Boulder studying Master of Arts - Education. She was a librarian for many years in the Boulder School District. Linda died on September 3rd, 2013. Steve still lives in Boulder, Colorado. His son Dave lives in Michigan with his wife Mandi and two children.